I was raised to abhor Hypocrisy, and to be pretty good at recognizing it. By hypocrisy and hypocrites I understood people who consciously espouse principles in which they do not believe, for purposes of manipulating people and gaining an advantage. An essential feature of classic hypocrisy is the agent’s awareness that he or she is being deceptive, and does not intend to act consistently with the principles so passionately espoused. I sense a growing trend around me of people whose actions do not follow from their stated principles and beliefs, who seem to be quite unaware of the inconsistency. In some ways this is more pernicious than hypocrisy in the traditional sense. A wrongdoer who recognizes that what he is doing is wrong (in either the moral or legal sense) has more inhibitions concerning the scope and frequency of the behavior than a person who has convinced himself that the action is morally acceptable or even laudable. The traditional hypocrite also tends to be less plausible and to be a poorer liar. I could give many examples, but I’ll have recourse to academic science since it is familiar territory and somewhat removed from hot button issues. Most people would agree that faking research results is wrong. A scientist who does so mainly to increase his prestige or salary, or to satisfy a third party such a granting agency from which he feels he is under some compulsion, is apt to be uncomfortable and a bit furtive. On the other hand, the scientist who thinks that the ultimate aim of his research is so overwhelmingly desirable that he is justified in publishing fiction confirming that the research tends toward that aim believes that he holds the moral high ground and will passionately tout his actions with a positively evangelical zeal. One is more likely to find this sort of double think in something like cancer research than in some obscure and rarefied discipline than the genetics of cyanobacteria. I found myself wishing that there were a convenient and generally recognized term for the phenomenon of an individual, institution or ideology whose principles are so internally inconsistent that they are poor predictors of future actions – in other words, they are untrustworthy and unreliable. I have used the terms “structural hypocrisy” and “oxymoronic institution” in the title in an attempt to convey the concept. An oxymoronic institution is one that is simultaneously committed to two or more mutually exclusive aims, and also requires that its employees and affiliates further all of them with equal diligence. The cancer research institute at Duke University (referenced above), which was involved in a serious scandal in 2015, is a good example. This is a prestigious University, presumably committed to the pursuit of the truth and also to improving the health of the population. The faked research results promoted neither, and it was clear that people much higher up in the hierarchy than the one scientist who was ultimately sanctioned for faking results were aware of the situation for years. However, they did nothing and continued to rake in Federal grant funds and put patients at risk by providing care known to be ineffective, because the business model of the university benefited from unethical behavior. Oxymoronic institutions beget structural hypocrisy. In most cases people who get advanced degrees in medical research, or in other demanding professions such as law where public service is an ostensible aim and motivator, start out being motivated by high ideals and a genuine desire to improve the human condition. This may well have been the case with Anil Potti, the disgraced researcher. It is only when these idealists are far down the career trajectory that it becomes evident that they are embedded in an oxymoronic institution and that compromising those ideals is a condition of remaining in the game. Along the way, they have been subjected to a fair amount of indoctrination tending to make them less aware of the moral quandary. 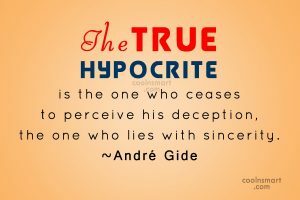 When I observe someone who is conspicuously and publicly displaying self-righteous outrage, I immediately suspect hypocrisy, especially structural hypocrisy. Everybody has some opinions on matters of moral and ethical import, and will at least occasionally express those opinions. A person who has thought about an issue and possesses some degree of humility will also recognize that his own side of the street is not entirely clean, and his evangelical zeal will be correspondingly muted. For example, I believe that I am well informed and have sensible, useful opinions on the interconnected issues of global warming, wasteful consumption, and income inequity, but I am also conscious that I am an American of average income and that whatever I do I am simultaneously contributing to these problems. I don’t see the same awareness in certain friends who are marching in the streets and shouting from the rooftops about the environmental sins of the one percent, or of certain corporations. Is America an oxymoronic institution, and are all Americans structural hypocrites by reason of their indoctrination into the system? Sometimes it seems so. The phenomenon is by no means confined to America, or to the present day. The same sort of pattern is discernible in the Papacy on the eve of the Reformation, or the British Empire in Victorian times. We do, however, seem to excel at it, and to propagate it in a more pervasive, coercive and far-reaching manner than historical predecessors.